We are passionate about saving fragile or unusable wood, and are proud of our new up-cycling process which reclaims otherwise waste material and turns it into a durable and stunning basis for show-stopping pieces developed through traditional woodturning. The stabilizing process uses a vacuum to remove all the air from the wood, replacing it with a heat activated resin that in turn forms a polymer backbone in pieces that would otherwise be too fragile to use. Additionally, resin of different colors and shades can be used to create various effects. 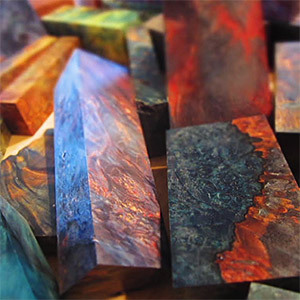 When colored resin penetrates wood, it results in unique coloring of the wood, artistically highlighting splendid natural grain figures. Our stabilized blanks are chosen for their extreme figure caused by spalting, a deterioration of the fibers of the wood by fungi. Stabilized blanks still may contain voids or areas that are softer than others. This is normal, and, as with any natural wood for turning, you may need to fill voids or reinforce areas with CA glue. Stabilization does add some reinforcement, but the pieces are still essentially wood and may not turn and finish like plastic. 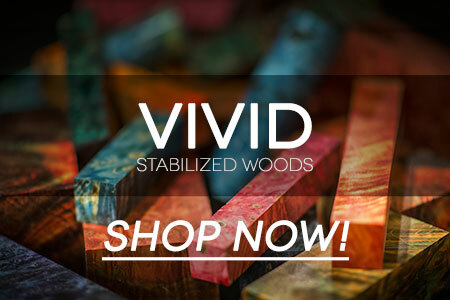 new partner web site, VIVID Stabilized Woods. We can also produce Custom Stabilized Wood in colors and sizes to meet your specifications! Learn about our wood stabilizing processes and see more examples at our dedicated stabilized woods site.